If you looking for a French cuisine at affordable price in a comfort and casual ambience, near the beach, then Sunrise Bistro & Bar at Big Splash East Coast will be a good place to consider. 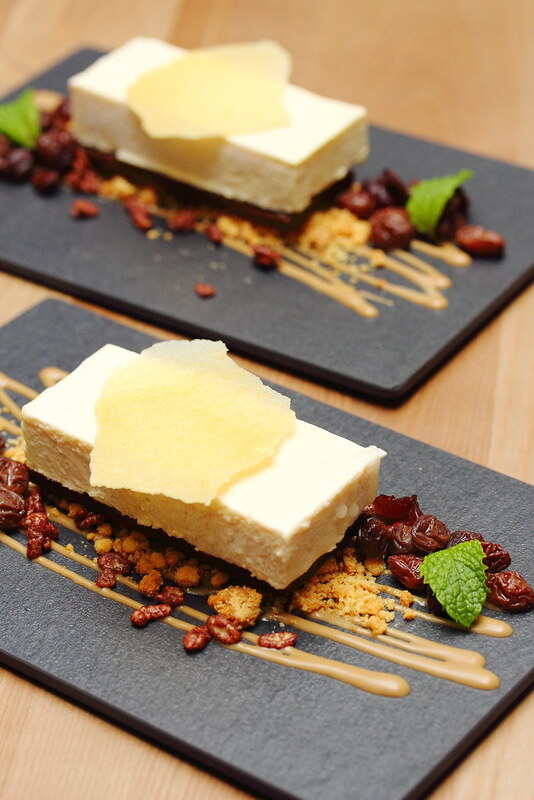 Sunrise Bistro & Bar is helmed by Execute Chef and Owner Vincent Teng with 22 years of culinary experience under his belt. He used to work at many well established hotels and restaurants, latest was at Table 66 and Skyve Elementary Bistro & Bar before venturing out on his own. The first dish that was served, already got me curious with Chef Vincent's cuisine. 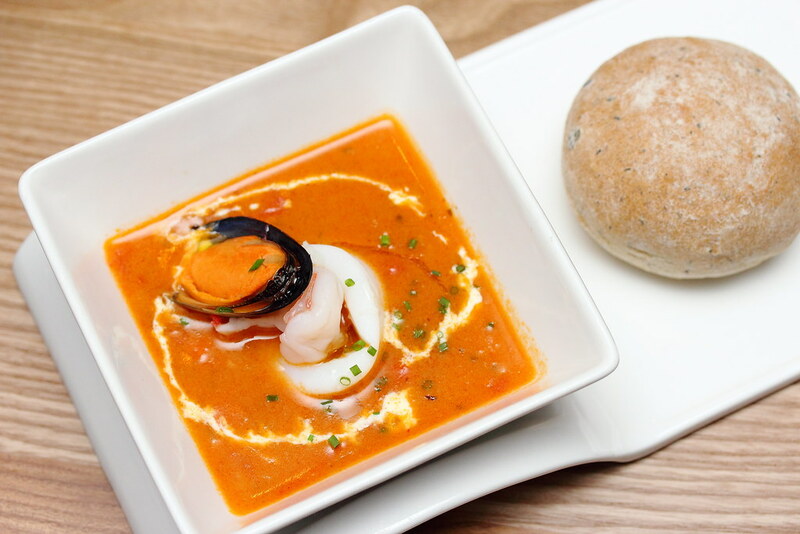 Tomato is added to the Seafood Chowder Soup ($12) to give it a bit of acidity on top of the creamy soup with seasonal seafood. It is then topped with chives and a few drops of extra virgin olive oil. The creaminess of the soup and the tanginess from the tomato provided a comforting and hearty enjoyment. I am not sure how the kitchen managed to sliced the luncheon meat into such thin slices. 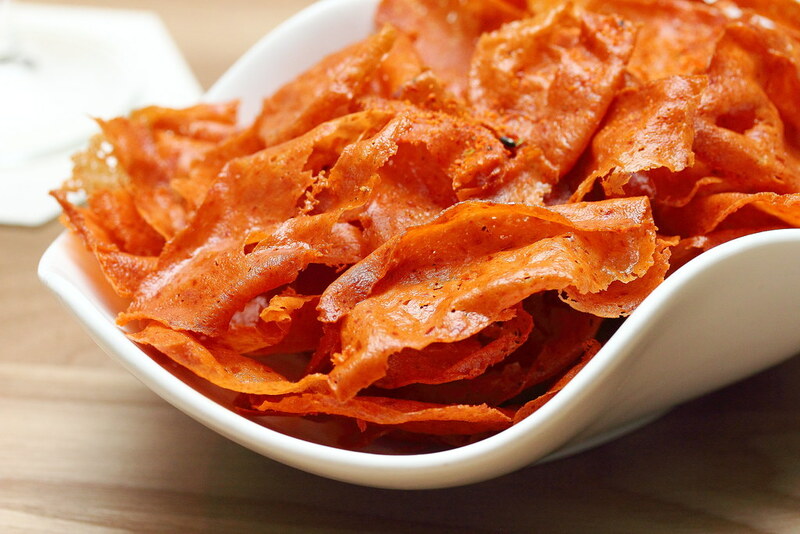 These Luncheon Chips are extremely addictive. The Seared Foie Gras ($19) is a nice starter before mains. 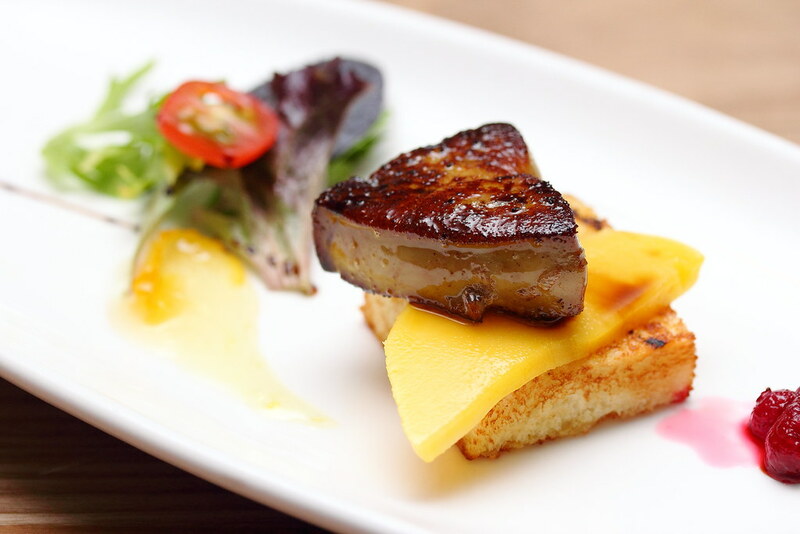 The beautifully seared goose liver is rest on a brioche bread layered with mango, with citrus jam and berry compote at the side. I like the use of mango to cut through the gaminess of the foie gras, with the jam and berry compote providing an injection of acidity. This is definitely not your usual fish & chips. 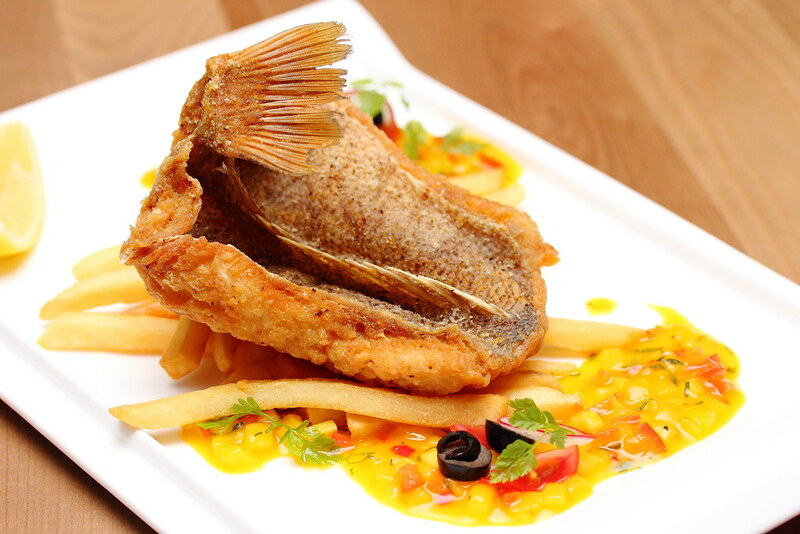 The Sunrise Fish & Chips ($26) actually comes with a whole red snapper deep fried to crispy. It is served with lemon myrtie pepper, mango salsa, tartare sauce and french fries. The other fish item on the menu is the Cereal Crusted Cod Fish ($28). 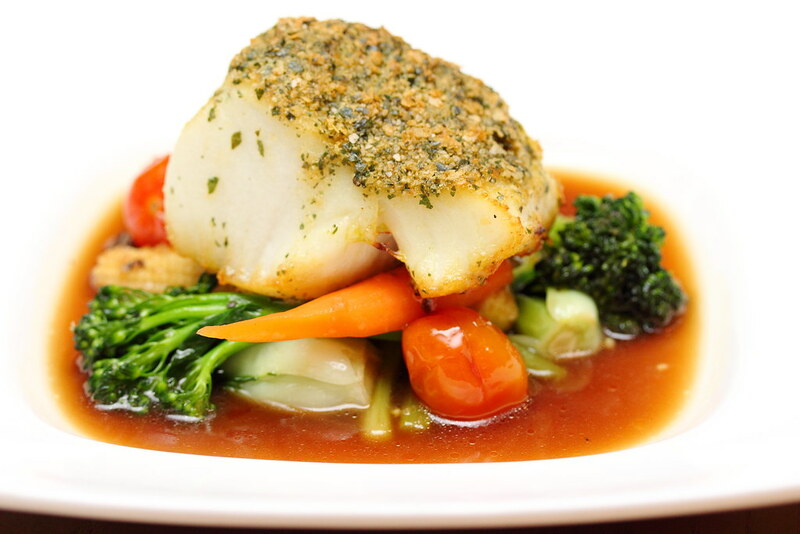 The cod fish is baked with cereal crust and served with vegetable braised in sesame oil, in a ginger shoyu broth. It actually tasted like a Chinese dish, like those Hong Kong style steamed fish with the ginger shoyu broth. Chef Vincent is known for his sous vide cooking which can be seen in the following dishes. 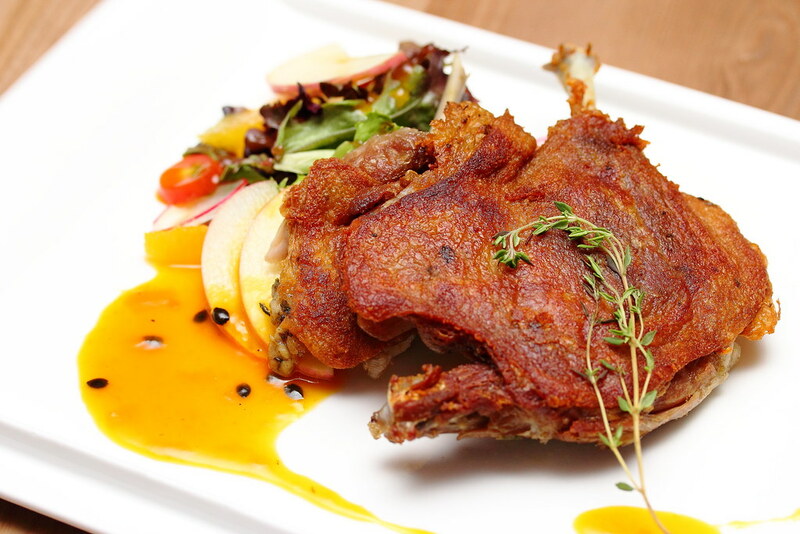 We started with the Asian Five Spice Duck Leg Confit ($28) which is sous vide for 8 hours, infused with five spice. 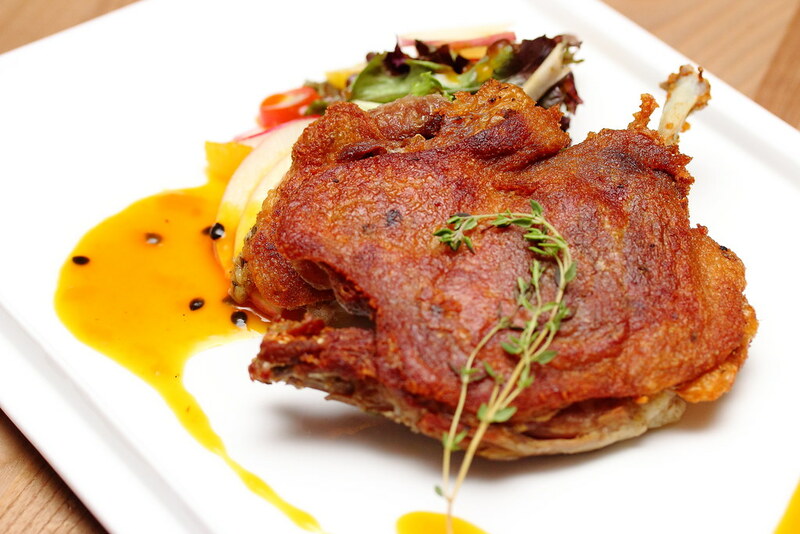 The crispy skin and the tender meat is paired with passionfruit sauce and served with citrus salad. A classic French dish with Asian inspired flavours, subtle but not throwing it off. 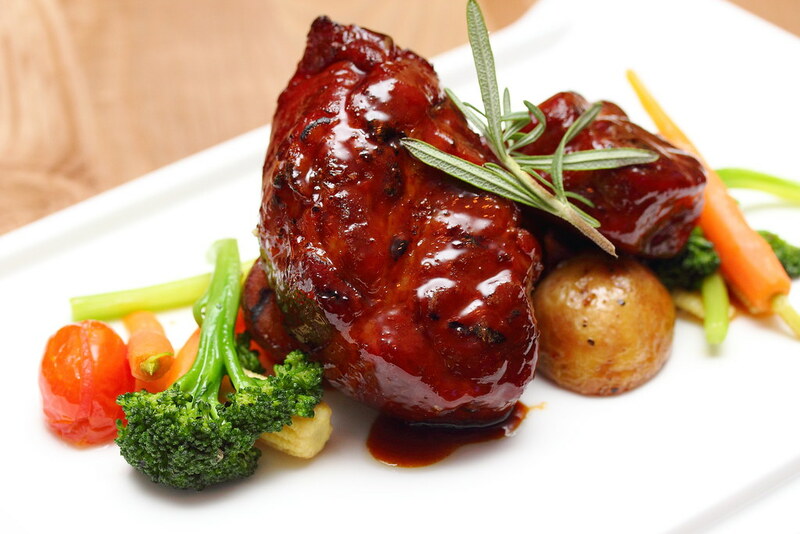 The Marmite Canadian Pork Shoulder ($26) is sous vide and grilled with marmite marinate. The pork shoulder has a consistent tender bite to it. The marinate gives a nice sweetness to it but I was hoping that the marmite taste can be stronger. 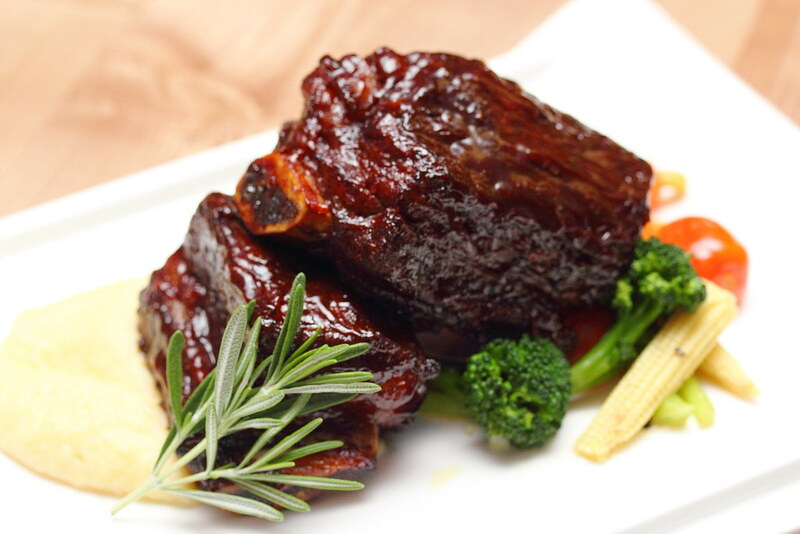 The BBQ Beef Short Ribs ($32) is sous vide for 24 hours and roasted in a homemade BBQ sauce. It is another enjoyable dish on the menu with the tender and fall of the bone meat. Moving on to the dessert, we had the Tiramisu Semi Freddo ($12). It is made up of semi frozen mascarpone cheese layered with coffee liqueur jelly sponge topped with milo crunch and tuile biscuit. Unfortunately the pretty presentation did not transpire to taste. I find the various components have too much individual character on the plate and it did not come together as a dish. 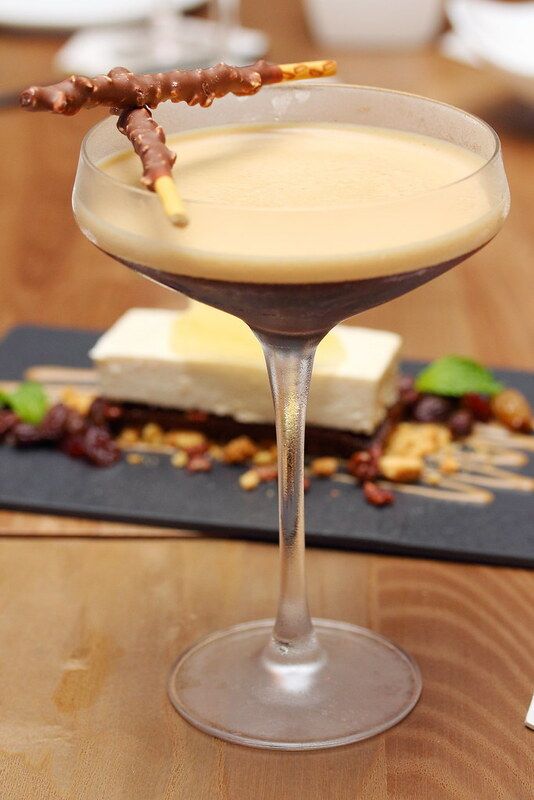 If the night is still young, hit to the bar and have an Espresso Martini. Sunrise has an extensive wine and beer list. 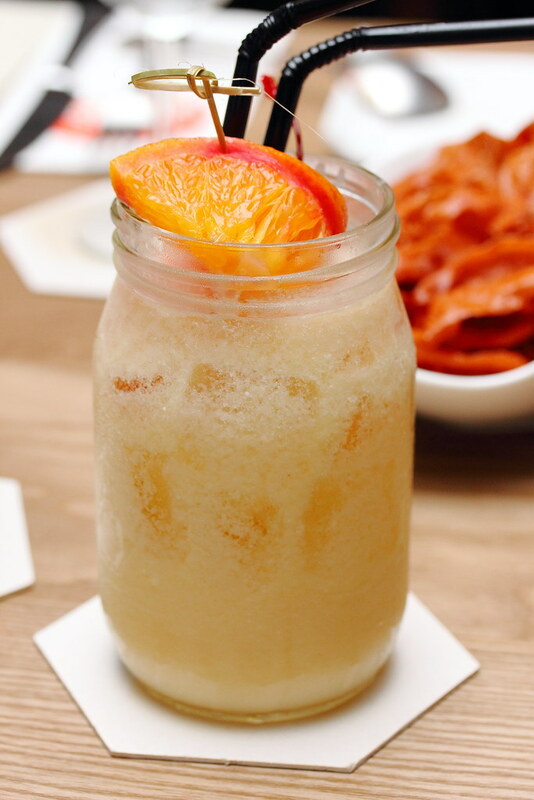 It also makes some great cocktails and mocktails. 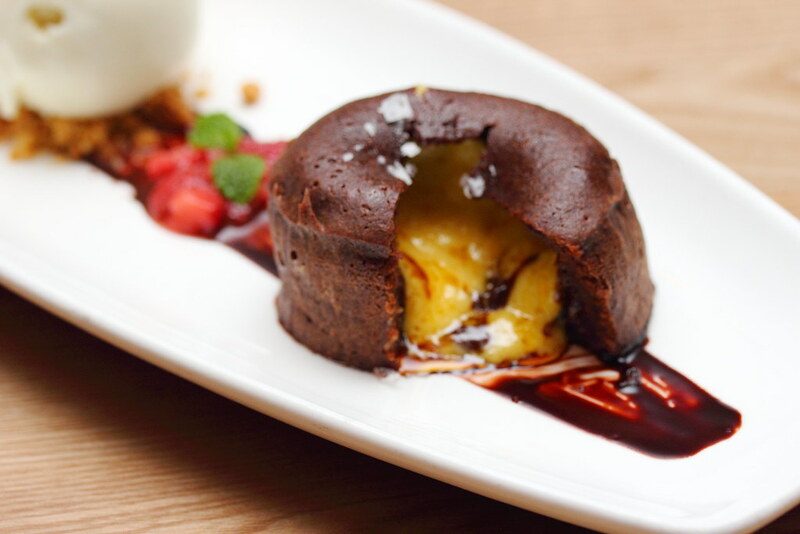 The most looking forward dessert for the night was the Salted Egg Yolk Custard Molten Chocolate Cake ($14). 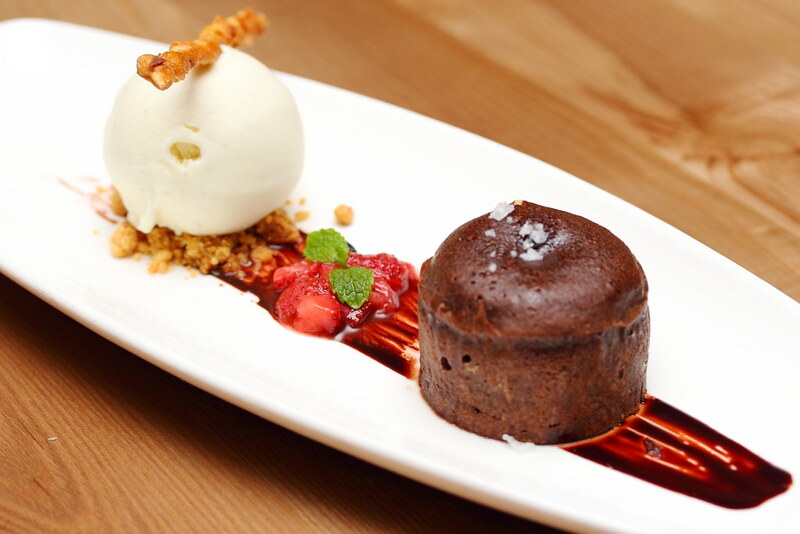 Cutting into the molten cake, is the flowing salted egg lava. Maybe it was my high expectation, I felt that the chocolate overpowered the salted egg and got lost in the richness. Sunrise Bistro & Bar presents a casual French fare at a more affordable price in a comfortable and casual ambience, near the beach. The quality of food at Sunrise is as good as what one can experience in fine dining, but at a much more affordable price in a less intimidating environment. * Note this bus service is only available on weekends and PH. The operating timing on Sat and Sun varies too. Please check SBS Transit website.